Arnhem Land is a life experience realized. 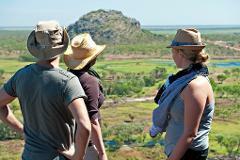 Towering escarpments, living culture, ancient rock art, Aboriginal People, beautiful billabongs and panoramic vistas. If you only choose one experience in the Top End, make it Arnhem Land. Our Arnhem Land sightseeing day tour is suitable for most guests, however you will be walking on uneven ground surfaces and up some small hills. Our Arnhem Land sightseeing day tour is suitable for most guests, however you will be walking on uneven ground surfaces and up small hills.